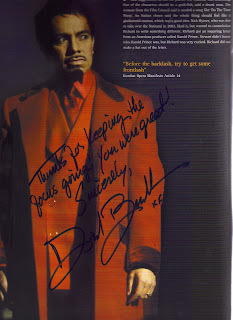 I was like a 15yr old fan when David Bedella (Satan in Jerry Springer) gave me his autograph. I found it hard to restrain my enthusiasm and admiration for this very talented singer but I tried my best to retain a professional composure as I proudly told him I was his Follow-Spot Operator for the entire show and how much I liked his singing. He is a very nice fellow and took my gushing compliments graciously but his wonderful talent really did make working this show a pleasure.